SHaw Cross Sharks produced an excellent second half fightback but were unable to overturn a 22-point deficit as they slipped to a 32-26 defeat at home to Castleford Lock Lane in National Conference Division One last Saturday. The Sharks fought to within six points of their opponents with four tries in the last 20 minutes but it was not enough and they suffered a fifth defeat of the season. Shaw Cross got off to the perfect start when they scored from the very first set, Owen Lumb kicked the ball to the right corner and Nathan Wright was first to the ball and raced to the corner to open the scoring. Lock Lane got their first score of the game through centre Jordan Rice when the ball was moved to the left and he barged over in the corner. The visitors then took the lead as Craig Savage ghosted through the Sharks’ line and went over between the posts. Lock Lane scored their third try when the ball was flung out to the left before being moved back inside for Joe Wilcox to score between the posts. The Sharks went further behind when Lock Lane barged over in the left corner before Wilcox scored the visitors’ fifth try of the half after a break down the middle. It took 13 minutes for the first points of the second half to arrive and Lock Lane scored through full-back Lewis Price. Greg Wilby thought he had reduced the deficit for Shaw Cross but his try was chalked off by the touch judge for a forward pass. Moments later Sharks scored their second try, Sam Ottewell darting through a gap to get the ball down. Shaw Cross scored for a third time, stand-off Lumb bursting toward the try line and stretching his arm out to get the ball down. Brandan French then put his name on the scoresheet when he was first to an Ottewell grubber kick, his try reducing the deficit to 12 points with 10 minutes to play. Sharks cut the gap to six points with five minutes to play as Tom Rodgers gathered the ball one handed and ran clear to score under the posts. Despite pushing forward for the final five minutes the hosts were unable to find their way over the line to rescue a point. 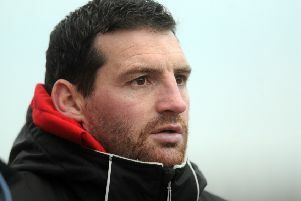 Head coach Brett Turner was bitterly disappointed with the defeat, saying: “We were very poor, the second half doesn’t make up for our showing in the first half. “I’m really disappointed, they are not one of the better teams we have played but the first half was the worst we have played all season.